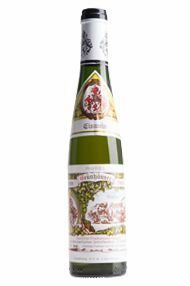 Constituting the later press fraction from grapes picked December 3, the 2010 Maximin Grunhauser Herrenberg Riesling Eiswein leads aromatically with prickly pungency of lemon rind and horseradish, behind which are yellow plum preserves and candied intensity of herbal extracts, both of which persist on a viscous yet persistently bright palate. Hints of salted caramel and white raisin add savory and ennobled notes to a prodigious finish of impressive purity and acid-integration as well as confectionary sweetness. This will bear careful monitoring (to the extent anyone owns enough bottles to afford doing so!) but I can envision it as one of that minority of Eisweins that will merit two or more decades of bottle-aging.